It’s one of those ADHD kind of making weeks. I’ve been flitting about from one project to the next. Working a little here and a little there. But no finished products to share today. Still working on this prayer shawl. My goal is to finish this by end of the month. Sure would like the intended recipient to receive it before spring hits. I jump over to the crocheted prayer shawl counterpart. 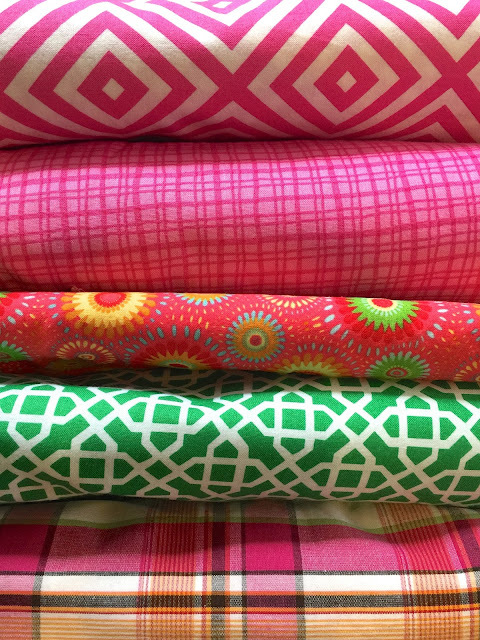 I’ve also pulled out a bunch of fabric from my fabric stash. Need to make ten zippered project bags ASAP. More on these next time. 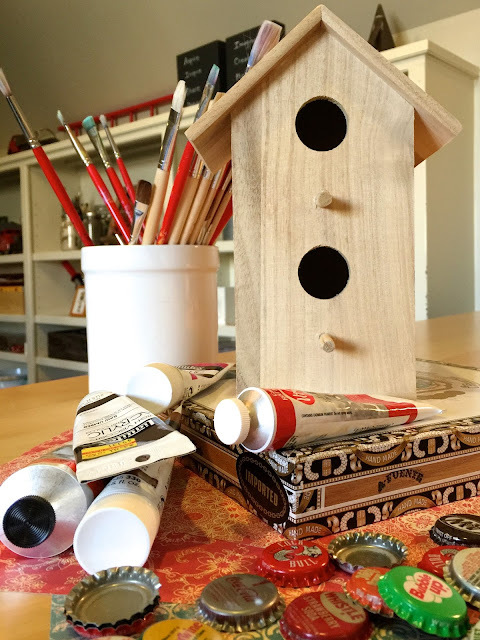 I’ll be decorating this little wooden bird house. To go with last week’s birds sitting pretty in the powder room. It’s a happy making week. Which would I recommend a novice to try? I am neither a knitting nor a crochet expert. Mostly as a vehicle for meditation. I have no patience for checking gauge or blocking. while I mull over ideas, watch movies or pray a little. I don’t need to be an expert to share what I know and love with others. Sometimes I knit along with more experienced friends. Other times, I get to pass on tips to someone just getting started. A complete newbie will ask me whether she should start with knitting or crochet? This is the one where you use one hook. Don’t be embarrassed if you didn’t know that. You are in the company of many others. The great thing about crochet is that you have only one stitch on the hook at a time. It’s a very simple matter to unravel a few rows and to get going again. Crochet can move really fast. I especially love crochet because I can “sculpt” with it. Baskets, flowers and amigurumi are my personal crochet favorites. 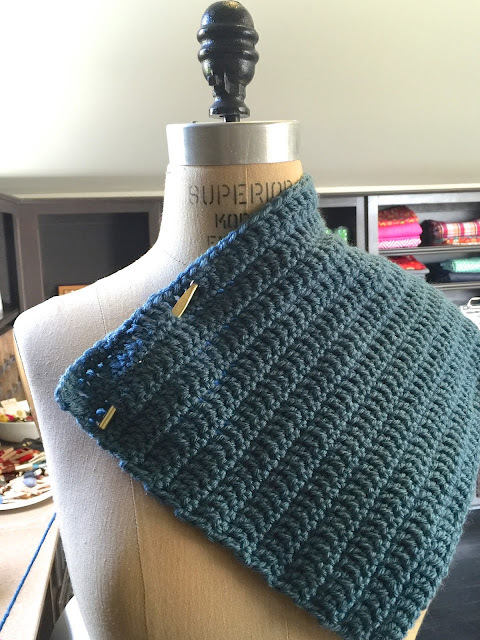 Never tried to crochet but want to get started? But know that you may have a frustrating lesson or two before you get the hang of things. In crochet, each hand has a job. One hand controls the hook. One hand controls the yarn and the tension. It may feel unnatural and awfully awkward at first. My advice to lefties is to just crochet the right handed way. Both hands have to work, after all. Do you really want to spend all that time flipping instructions and diagrams in your mind? 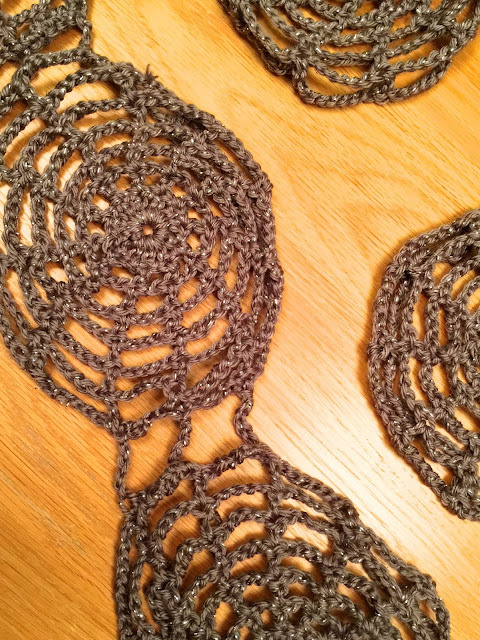 I have one big gripe about crocheting. I have a tendency miss stitches. I like to crochet while watching movies. I’m not looking at the growing fabric in my hands. Sometimes my hook passes over the next stitch and I might not notice til the credits are rolling. This is the one that calls for two needles. And all your stitches are on one (or both needles) at all times. The actual knit stitch is very doable. The scarier part is what happens when a mistake needs to be un-knit. Or a dropped stitch needs to picked up. I think the actual fine motor skills of knitting are are easier to pick up than crochet. But dealing with knitting mishaps are worse. What knitter doesn’t develop a strong and lasting headache when pulling the stitches off the hook and unraveling? My knitting nightmares include getting all those stitches back on the needle in the correct orientation. But I do really like the look of a knitted fabric. Garter stitch nice but oh so slow to grow. Stockinette pretty, even if it rolls at the edges. Ribbing is functional and knits up fast. Love the look of cable (hate the counting). Think linen stitch is gorgeous. I am a very S_L_O_W knitter. It takes me forever to finish projects. I’m 15 inches into a 60 inch prayer shawl. 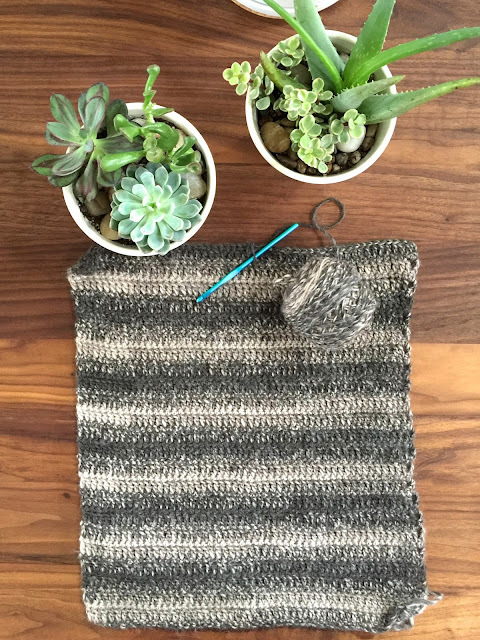 Knitting with a variation of a garter stitch. I think both are worth learning. Each has its quirky tricky parts. And used to create wonderful things. Did you see something that inspired you? Why not make that first? And maybe pick up the other skill a little later? 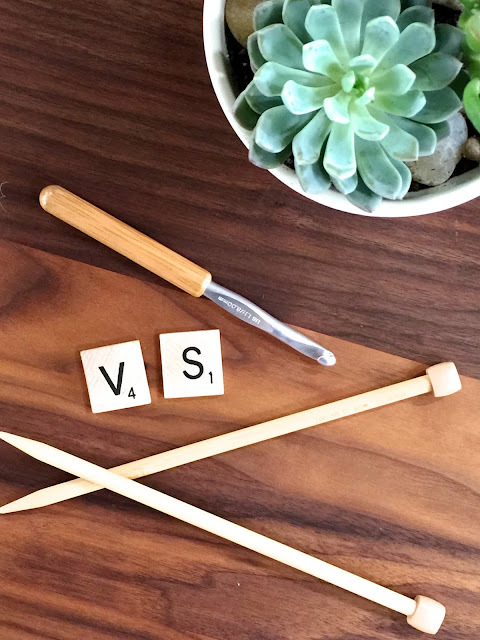 Why does it have to be hook versus needles? Icy rain and sleet keeping us inside. Got a draft blowing through every single window in our house. I don’t like blasting the heat. (I’m quite the sight to behold). This has been sitting abandoned for almost a year. Proved to myself I could indeed cable if I really wanted to. Then decided I didn’t want to. I lost interest in counting and tossed what little I’d knit into the yarn stash. Shortly after, we experienced a pivotal family moment. Moved from NY to NC. Set up a whole new life. And pretty much forgot about knitting til last week. 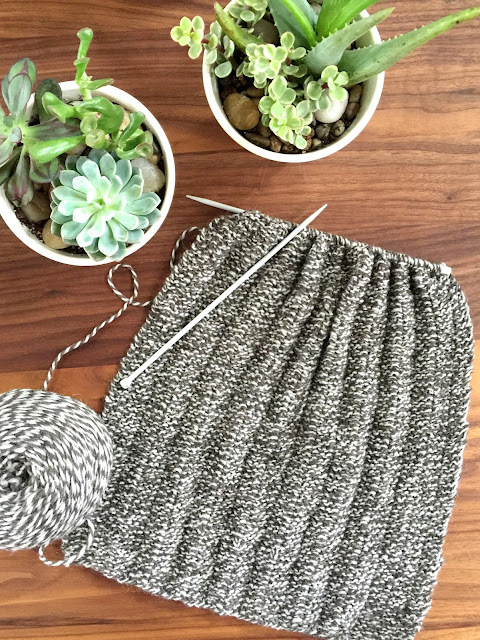 The sudden cold weather triggered the urge to knit. 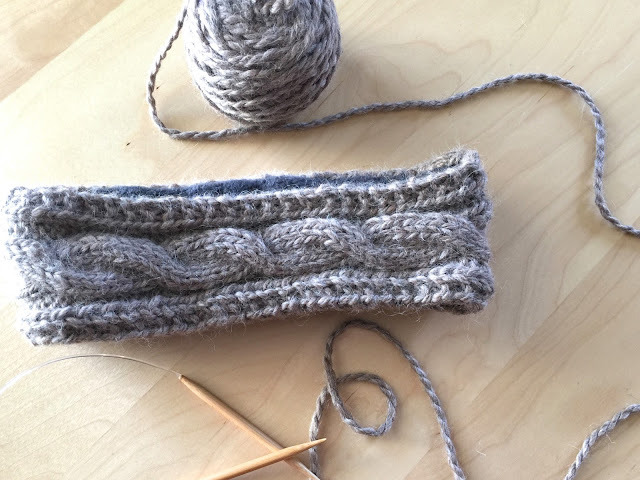 What better project to start with than this little headband? 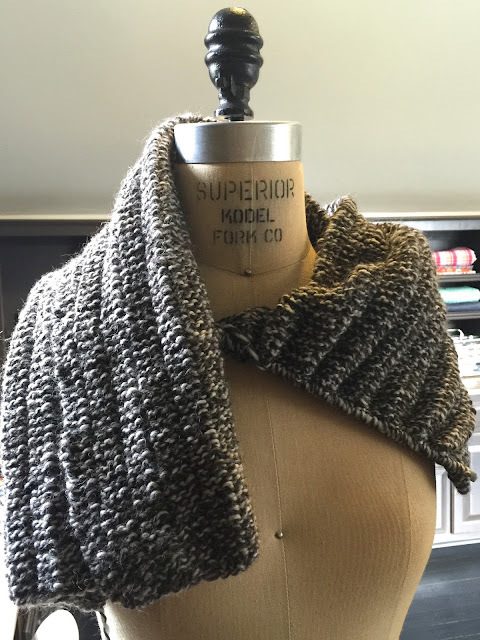 The pattern is “Big Cable Scarf” by Jami Brynildson. However, I used #8 instead of the suggested #17 knitting needles. And worsted weight instead of bulky weight yarn. 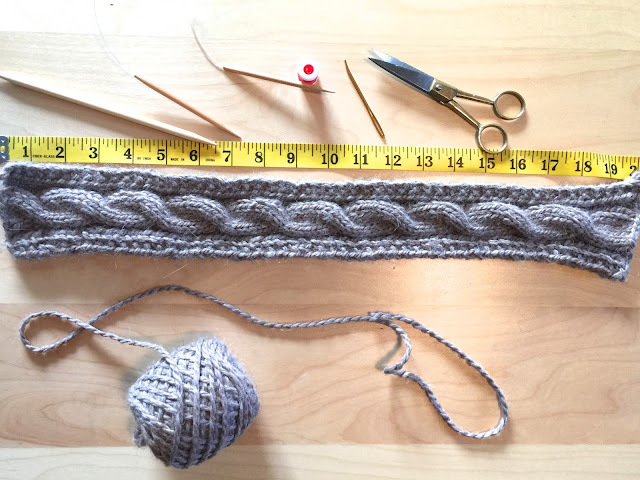 After knitting 103 rows, my swatch measured 20 inches long by 3 inches wide. But just perfect to form a headband. I added a fleece lining. I cut a 21 inch by 4 inch fleece rectangle. (Fleece does not stretch in all directions). Folded the edges over a half inch along the two long edges for the fleece rectangle. Wrong side to wrong side. Finished the edges with a decorative stretch stitch. Next, I folded the fleece rectangle in half. This time, right side to right side. 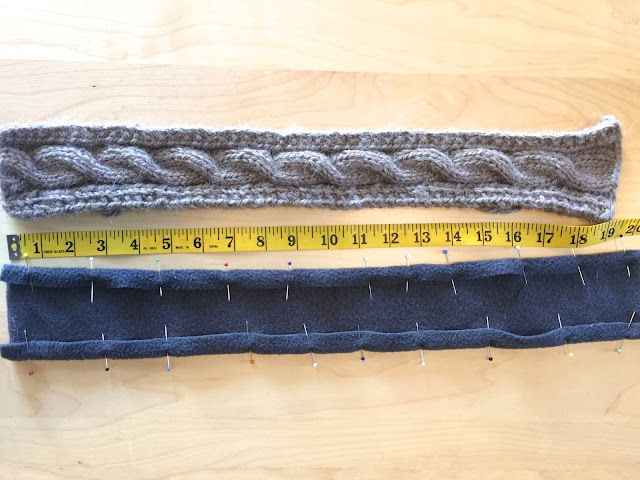 Used a half inch seam allowance and stretch stitch to sew the inner headband together. Finger pressed the seam open. (unless you want to melt your fleece and make a mess of your iron). 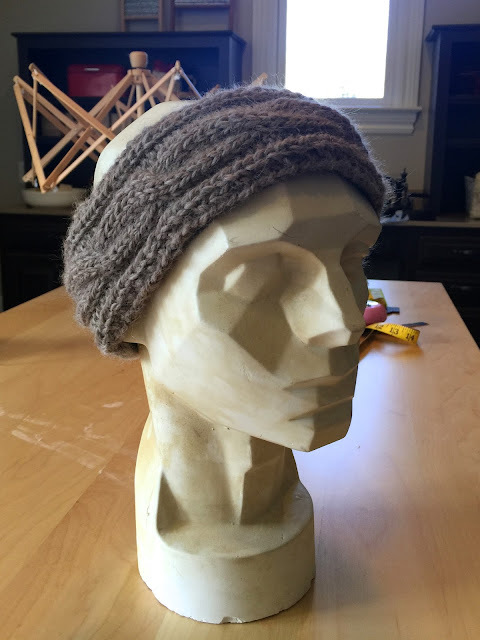 Used the yarn ends to stitch the knit outer headband together. Wove the remaining yarn ends into the cable knit fabric. I tucked the outer portion of the headband into the inner portion. 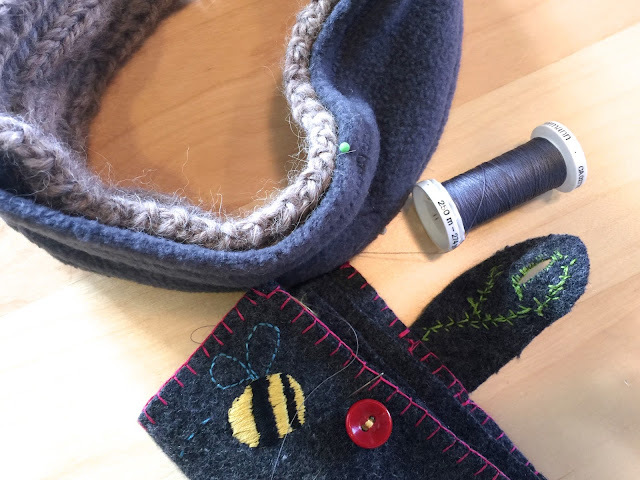 Then hand stitched fleece headband lining to outer knit headband. It’s a super comfy headband. I’m glad to have it on this wet dreary winter day. 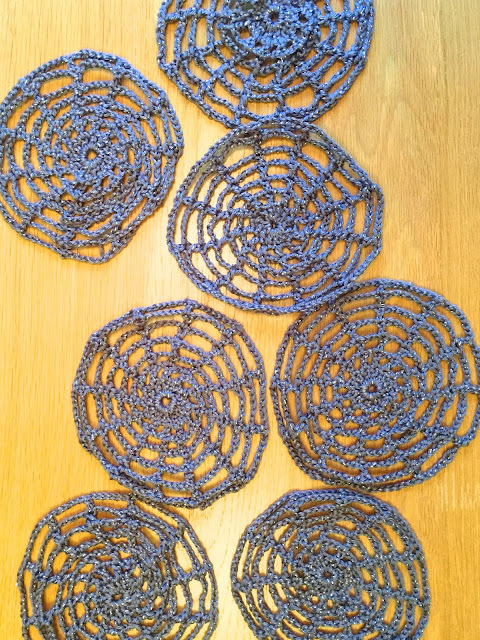 Last Spider Web Craft… Promise! This is really the last crocheted spider-web-anything this season. I decided I “needed” a scarf to go with that nutty spider web hat. Took my US I (5.5mm) hook out again. Made a run to the store to get one more skein of glittery silver yarn. Then churned out 7 more webs (7 rounds each). Once again, here’s the tutorial I first followed to learn how to make these. I used chain stitch to connect the 7 small webs end to end. Then chained and double crocheted one more time around the entire perimeter. 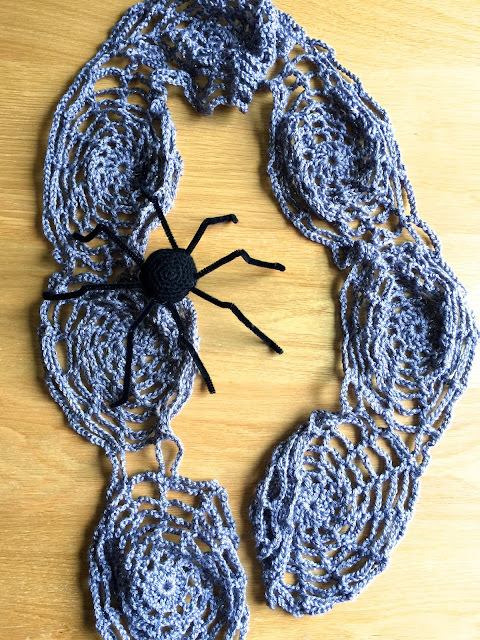 My spider web scarf measures just under 6 feet long. I paraded around the house with my hat and scarf last night. Got teased for making 70’s throwback attire. But I’m really liking this set. 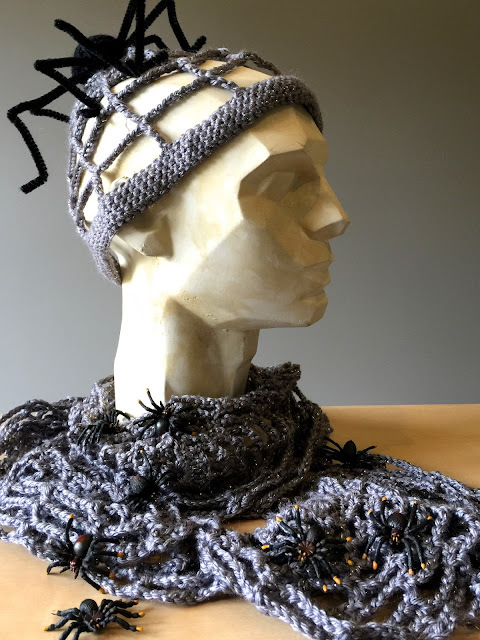 Spider web cap and scarf. With spiders attached of course. Enough of these spider webs already! Onto the next craft project.